Despite the rain, this has been a busy several weeks in the garden. My assistants have been raking leaves, I have been weeding and cutting back some of the dying foliage, as well as planting lots of bulbs and other spring flowers. One of my friends once described someone’s display of orange blooms as a “cheese garden”. Well, I guess this makes me a cheese gardener, because I almost always select the orange tulips when given a choice, and next spring my garden will display an array of orange hues. Actually, I also planted a lot of pale pink tulips this year as well, which I do think will go together with the orange flowers. In addition to the bulbs I planted two weeks ago in the front, I planted 12 “Praestans Shogun” botanical tulips in the bed with the rhododendrons (see below). Since they are naturalizing, I have high hopes that they will become established in that area. 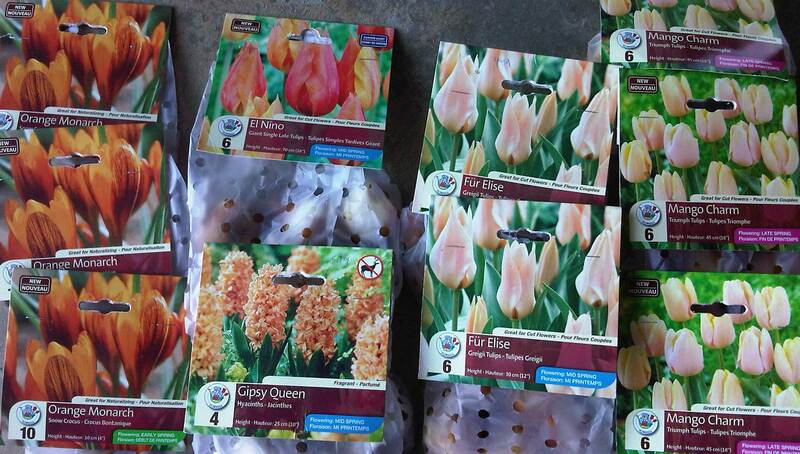 The rest of the bulbs I planted in containers – “Pineapple Express”, “Mango Charm”, “El Nino” and “Angelique” tulips, with “Gypsy Queen” hyacinths – because they never do well a second year in the soil so I will throw them out after they bloom. I mixed lots of bone meal into the soil to fertilize and covered the containers with wire to deter the squirrels. As a side note, I have dug up a lot of acorns lately, which tells me the rodents have been active in my garden. Boo. The only bulbs that I have left to plant are several types of snowdrops (all naturalizing) and blue poppies which are also naturalizing. 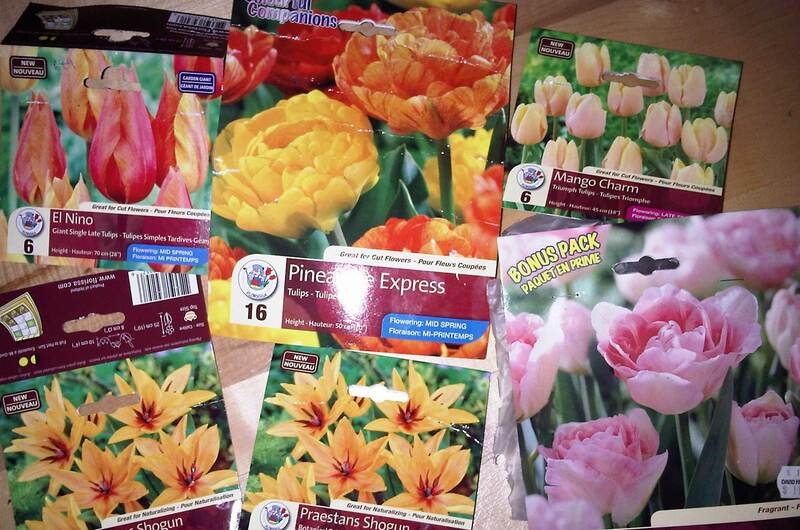 I am not sure where I am going to plant these yet, but this will likely be in some of the empty areas in the front. This entry was posted in Uncategorized and tagged bulbs, tulips. Bookmark the permalink. Cheese, schmeeze. I love orange tulips! My favourite are Ballerina, a lily tulip with a heavenly fragrance. I like to plant them in a pot on the front steps so I can have a sniff as I come and go.